Hey everyone, Jeremy here again for another review. As you all know, I love talking about different tools to use to better manage your personal finances. I’d like to share a cool new marketplace that you might like to check out. It’s called LendEDU. You may have seen them recently on Huffington Post or Forbes, but just in case you haven’t heard of them. LendEDU is a marketplace for student loans and student loan refinance. 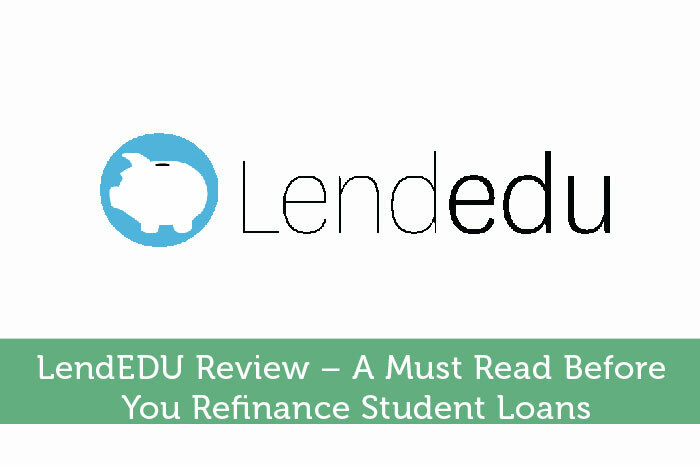 LendEDU is a very new company working to help student loan borrowers get the best rates and terms on the market. The company may only be a year old, but LendEDU has quickly made a name for themselves in the student loan industry. In this review, I would like to tell you why they are growing so quickly, and highlight some of the positives and negatives of using their marketplace to find the best student loan lenders. Let’s get to it! LendEDU was started in 2014 by student loan borrowers unhappy with the student loan industry. The founders of the company created LendEDU to add transparency to the student loan markets and to save student loan borrowers money. The guys over at LendEDU found that student loan borrowers were overpaying for their student loan debt. LendEDU works to find consumers the best student loan and student loan refinance rates with one application. LendEDU is a marketplace for student loans and student loan refinance. In other words, LendEDU is the Kayak for student loans. LendEDU is a free service for student loan borrowers. The company works with the top student loan lenders including SoFi, U-fi, CommonBond, LendKey, and many others. Comparing student loan lenders isn’t an easy task. These days, there are plenty of student loan lenders jockeying for your business. But comparing these lenders is tough. Before LendEDU you needed to submit multiple applications just to get quotes from each lender. What LendEDU does is centralize the process of comparing student loan lenders. All you need to do is fill out one short application. It took me about 5 minutes to complete. After that, LendEDU does a “soft” credit pull. Using you credit information alongside your application information, LendEDU then prices quotes from their lender partners. LendEDU’s service does not affect your credit and is completely free for consumers. As I understand it, LendEDU is paid by the lender partners they work with. LendEDU works with a mix of lenders such as traditional banks, online lenders, community banks, and even credit unions. After you’ve received quotes on LendEDU, you must fill out and submit your lender’s application in full to lock in an offer. LendEDU does not currently pass your information through automatically. First off, LendEDU is a completely free service. I love companies that have free solutions to help consumers save money. The biggest benefit of LendEDU’s marketplace is that you can get multiple student loan quotes with only one application. It would take hours to get quotes from all of LendEDU’s partners if you had to submit each application individually. Moreover, each lender application you would of submitted would of counted as a “hard” credit pull. LendEDU doesn’t hurt your credit because they only do a “soft” credit pull. LendEDU differentiates itself from other student loan comparison websites by providing very accurate quotes. Other student loan comparison websites just show generic rate information. LendEDU shows very accurate quotes. LendEDU is able to do this because they have your credit information on hand. Some of LendEDU’s lenders will show exact quotes (ex. 4%), others will show very narrow ranges (ex. 4% to 5%). This makes it easy to spot which lender has the best rates available. Furthermore, you don’t have to waste time applying to lenders with uncompetitive rates. LendEDU works with many different types of student loan lenders. That being said, most of these lenders are focused on student loan refinancing. The company does offer a private student loan marketplace, but there aren’t as many options available. On the private student loan side, LendEDU only works with about 4 private student loan lenders (vs. the 8 student loan refinance lenders they have). I walked through the process of using LendEDU above. The biggest down side of LendEDU’s process is the fact that you need to re-submit some of the same information again on the lender’s application. I reached out to the founders of LendEDU. Nate told me that LendEDU is working on a way to automatically submit your application information to their lender partners. Nate hopes that this feature will be done sometime this fall. You should also know that you will need to submit your SSN on LendEDU’s website. Some people may be weary to give out personal information online. LendEDU needs this information to properly pull your credit and price their quotes. It would be really cool if LendEDU didn’t need to collect this information, but it looks like it is a requirement. 7 out of 10 college graduates have student loan debt. And with $1.2 trillion in student loan debt outstanding, student loans are a huge problem in the United States. You should consider using LendEDU if you are looking for a new private student loan or are looking to refinance student loans. LendEDU’s platform is best for people looking to refinance. If you are stuck paying high interest rates on federal or private student loans, LendEDU can help! LendEDU works with multiple lenders who offer rates as low as 1.90%. While not everyone will be able to get this sub-2% rate, many people will be able to refinance in the 3% to 5% range. Also, if you are looking for a private student loan LendEDU is a great place to start. Why not get the lowest rate from the start! LendEDU works with a couple private student loan lenders who have rates even lower than the Department of Education’s federal student loans. LendEDU only works with credible student loan lenders. So there are no application, origination, pre-payment, or other fees.